Oricon has released the figures for the top 200 selling singles of 2009, records are kept from 2008-12-22 – 2009-12-14. Below I’ll include the singles of relevance but you can see the full list here. hmm i don’t know if this is shocking or not. i’m gonna go with not. to me it feels like everyone is in a slump tho. To be honest I think Morning Musume were lucky to get a single in the Top 100. I have downloaded all of AKB’s singles but i don’t know.. they haven’t grown on me. my friend said when she visited japan, AKB is really big. advertisments everywhere and wotas getting in line for AKB merchandise. oh well… no more love for MoMusu? huhuhuhu! 2009 is definitely AKB’s year. i hope MoMusu’s future will be brighter. Yeah, AKB is really big in Japan, they have adverts all over here. Going to Akihabara is also quite something, Morning Musume have no district to call their own! H!P isn’t dying out. Momusu has more than doubled last year’s sales total. 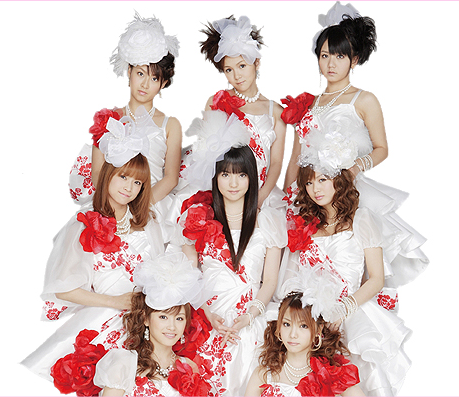 Berryz released their second and third best-selling singles of their entire existence. C-ute’s sales have been fairly stable throughout the year despite the lineup changes, and Manoeri sold over 100K copies in her debut year. S/mileage is also on the horizon. I think the fact that they’ve got significant competition is a good thing because it forces them to up their game a bit plus they gain exposure just by the fact that they’re competing. Yes, AKB is on top of the world right now. Their new label has been good to them promotionally and they have released a few common-interest singles this year (a graduation song and a birthday song) that were pretty much guaranteed sales as long as they got airtime. However, they have a lot to live up to with their next single release musically. That’s the problem with having a really good song like RIVER – it becomes a yardstick against which all other singles are compared. I am also concerned about some of Aki-P’s recent choices. If H!P can weather this year I think they’ll be around for a long time to come. They’ve been trying some new and interesting things and I am interested in seeing what happens in 2010.
woo hoo! berryz outsold c-ute yes!!! i feel all of the groups/bands will do better in the charts if they all just slow down alittle, they seem to flood the market with with new singles, with each group having a new one every 8-12 weeks. p.s, i was disapointed not to find momoko in my stocking this x-mas….. Morning Musume’s 40th single, Nanchatte Renai, has charted at #2 this week with sales of 54,973 – their best first week since Iroppoi Jirettai in 2005! Let’s hope they reach at least 60,000! 4th Day 1445? No way! ^ It’s a new week now I’m pretty sure, Oricon runs Tues – Wed.
With the way they’re promoting this single, I think they’ll be able to reach and surpass that. It’s great that they’re really starting to promote their singles more. Maybe they’ll begin pulling in a younger, female audience soon. I’ll keep my fingers crossed! yay!! !they may not have gotten #1*(stupid Ayumi)* but still #2 aint bad at all! Its soo good too see them charting high again and with there sales this high hopefully now they know with the next single that they can get there sales up even higher. looks like they passed up Kanashimi Twilight like you hoped :D I’m not surprised they didn’t get #1, but I’m very surprised by the sales :O No doubt a good portion of that is the Western fans who bought through HMV Japan and amazon. xD I hope their next single sells even better! Maybe they can get another gold record? In it’s first two days of sales Morning Musume’s 40th single, Nanchatte Renai, has sold 34,247 copies and charted at No.2 both days just behind Hamasaki Ayumi, today only about 2,000 copies behind! Let’s hope they stay at No.2 for the rest of the week – there’s a decent ammount of promotion going on, maybe this will top Kanashimi Twilight…?